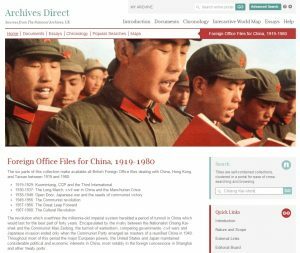 Foreign Office Files for China provides access to the digitised archive of British Foreign Office files dealing with China, Hong Kong and Taiwan. The Library had already purchased access to the files covering the period 1949-1980, broadly covering the Communist Revolution, the Great Leap Forward and the Cultural Revolution. The Library has now purchased the files covering 1938-1948 to enlarge access to this fascinating resource. The files from this period are particularly rich in material on China’s war with Japan, which proved vital for Mao and the Communists’ long-term success. However, other topics covered by these files include the ‘Open Door’ policy, the North China Incident (1938), post-war relations between Communist China and Hong Kong, anti-British propaganda, The United Nations Relief and Rehabilitation Administration (UNRRA) and more. This was a period of significant turmoil and upheaval in China and Foreign Office Files for China gives access to formerly restricted British government documents including diverse materials such as diplomatic dispatches, letters, newspaper cuttings, maps, reports of court cases, biographies of leading personalities and summaries of events. Access the database via the Databases A-Z list. 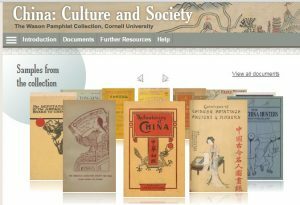 Covering the period c.1750-1929 this database makes available for the first time extremely rare pamphlets from Cornell University Library’s Charles W. Wason Collection on East Asia. Mostly in English this collection contains around 1,200 items in 220 bound volumes and these pamphlets form part of one of the most extensive collections of literature on China and the Chinese in the Western world. The pamphlets have all been digitised in colour, many are illustrated and feature beautiful cover art. The collection is full-text searchable. Annual reports, catalogues, exams, guides, journals, lecture notes, letters, minutes of meetings and speeches are just some of the types of material that you will find in the collection. And themes covered by the collection include education, emigration, the foreign presence, missionaries, wars, rebellion, reform, opium, healthcare and language. Access to both of these databases is only available to current staff and students at University of Edinburgh. This entry was posted in Library, New, Online resource and tagged China, Databases, History, Japan, journals, Letters, primary source by cstirling. Bookmark the permalink.